Pastor Caleb, Andrea and family moved to the Lake Country area in 2017 after spending the previous 9 years in N.W. Illinois where Caleb served as a Senior Pastor for 9 years. 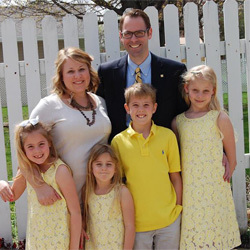 Before ministering in Illinois, Caleb served as an Associate Pastor in Carmel, Indiana. Caleb also served as a deacon at Grace Community Church under the leadership of John MacArthur. His personal mentorships with Pastors Jerry Wragg, Carey Hardy, Kent Kolstad, and Joe Flatt have forever shaped his life and ministry. Caleb earned a BA in Communications with a minor in Biblical studies from the Master’s College. In 2005 he graduated from the Master’s Seminary with a Master of Divinity degree. He is a second generation shepherd and is currently finishing his Doctorate in Expository Preaching from TMS. Caleb’s bride, Andrea, received her MA in Biblical Counseling from the Master’s College. She has been a guest speaker at the “Women Discipling Women” Conference. Our pastor’s wife is also a certified member of the Association of Certified Biblical Counselors. When she is not homeschooling or caring for her family, Andrea loves serving God’s people in the local church.